Simple and red... cute blue eyes... anyway, enjoy it ! Very pretty! I love how you added the roses. Gorgeous bg,it looks like there's giant roses or blood cells back there.The girl's cute too^^*. btw: What's that in her hand, a diamond or other stone ? I really love the background effect in this wall!! It's dark and gothic, but very beautiful. It compliments the character. 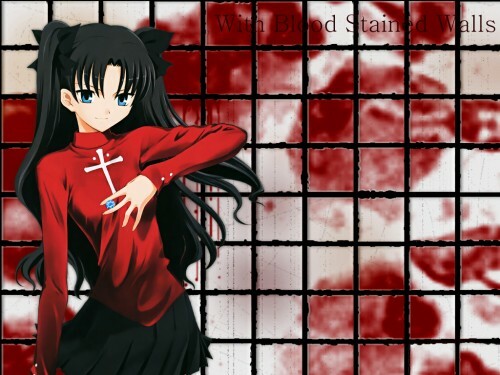 That's well done -- I like the black grid pattern with the blood stains (are they? If they're not, I'm just not perceptive >_>) behind. The character herself is pretty ^^. Nice! Nice wall, I love it. I dont know why some people perhaps dont like the bg, but I like it. Good job. keep it up! nicely done!!!!!!!!!!!!!!!!!! i luv red with all my heart!!!!!! !